This is a generous portion of moss packed in a 5 x 8 x 14 priority mail box and will total 1 lb. 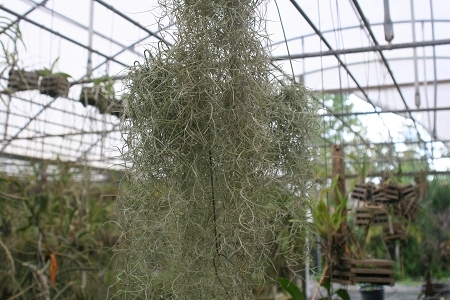 Spanish Moss is actually a bromeliad air plant (Tillandsia usenoides) and drapes many trees in the Deep South. It does not harm the tree and actually acts as a filter and oxygen producer and building material for many bird's nests. You can spread this around the greenhouse or sun room or sunny window, as a ground cover for potted plants, drape in trees in the summer, cover a Christmas tree base or in the tree itself, use as a "green" packing material and other miscellaneous uses. This was the liveliest moss I have purchased. I bought from another last time and it was so-so. This moss is alive! This is the best choice online !